This low-profile scissor motorcycle jack is ideal for servicing motorcycles and ATVs up to 499-kg. The true motorcycle or ATV enthusiast is likely to have a motorcycle lift in his or her garage. A lift of this kind enables operators to work on the wheels of their bikes. Without it, full wheel service on a motorcycle or ATV is simply impossible. 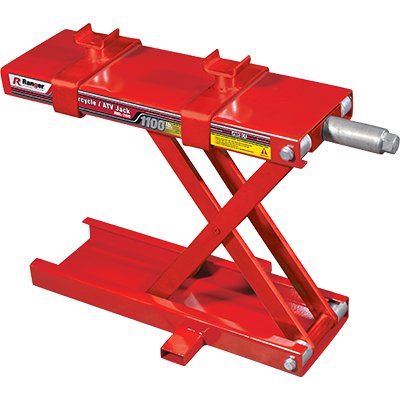 Platforms are great for elevating bikes, but only the RML-1100 motorcycle jack can provide the rugged support you need to efficiently maintain bikes at home or in a professional setting. The low-rise RML-1100 Motorcycle and ATV Jack is crafted to be both rugged and durable. It provides your motorcycle service and repair projects with the maximum adaptability you’ve always needed. You can use this jack with a motorcycle lift platform, or simply place it on the ground. Do whichever is most convenient for your specific motorcycle project. Easy operation allows you with just the right amount of extra lift when performing service, maintenance or repairs on a motorcycle, bike or chopper. With a maximum raised height of ​41.9 cm and two easily adaptable saddle adjusters for even more versatility, this speciality motorcycle jack will increase overall service capacity and give you the convenience of extra ground clearance wherever you need it the most. Motorcycle enthusiasts love to customise their bikes, and sometimes those custom frames can deliver complications during lift applications. Luckily, the RML-1000 motorcycle lift is perfect for shops or situations on-the-go that require fast, safe lifting. You never worry about bike frame damage or toppling with a Ranger motorcycle lift, which is why customers choose us over the competition time and time again. The RML-1100 Motorcycle / ATV Jack works in perfect harmony with either the RML-600XL or RML-1500XL motorcycle lift.